Caiman free games: Sky Cars by Bryce Fitzsimons. Welcome to the world of SkyCars. SkyCars is a game of interesting genre: a platform obstacle course / racing game set in exotic areas of the universe. 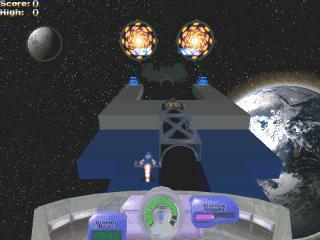 The idea is based on that of Bluemoon Interactive's game, SkyRoads, but has many new additions that the original did not. SkyCars is a full 3d remake, more than complete with obstacles, asteroids, hyperspace warps, rings, jump pads, explosive mines, and different vehicles with distinct traits - to name a few features. While there is no end-of-game goal in this release, the game is driven by the motivation to complete the tracks, to earn the highest scores, and to unlock new vehicles. Additionally, there is a level editor, SkyEdit, available at the GalaxyWare website. Please feel free to download it, create your own tracks, and share your creations with the rest of the community via the website's forums. Arrow keys - for acceleration/deceleration and turning. Esc - to pause / bring up the in-game menu. For further instructions and customization help, please read the in-game help. If you've set the video mode to an undisplayable mode, execute SkyCars with the "-safe" command line parameter and then change the video mode. If you have any further questions, comments, or concerns, please visit the GalaxyWare forums. In the future there will most likely be another demo version of SkyCars, and eventually a commercial version with many new tracks, cars, and cool features. Check the page for undates. I hope you enjoy SkyCars, as I've certainly enjoyed creating it. My thanks go out to my friends, The Game Creators who created the old yet faithful DarkBASIC programming tool, and the DarkBASIC community. Download from galaxyware.dbpcommunity.com 4,45 MB. Editor for SkyCars 1 (download from caiman-us) 1,4 MB.